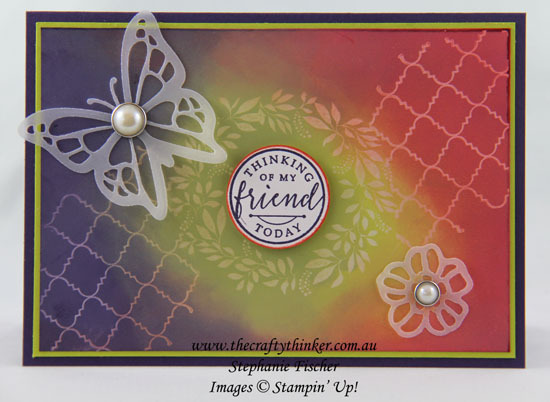 Welcome to the Crazy Crafters' Blog Hop with our Special Guest stamper, Tanya Boser - we are thrilled to have Tanya join us this month and so excited to CASE (Copy And Selectively Edit) any project that has been created by her . As a member of the Artisan Design Team and also manager of the Stamp Review Crew Tanya generously inspires us all whilst at the same time entertaining us with her great sense of humour! So this is Tanya's card that I've chosen to CASE. It features the ghosting technique and some vellum. And this is my CASE of Tanya's gorgeous card. Versamark resists the ink and leaves a "ghosted" image. 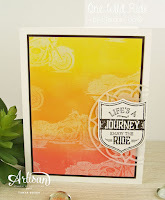 I stamped the Hello Friend images with Versamark onto Glossy White Cardstock and then sponged randomly with Elegant Eggplant, Lemon Lime Twist, Pear Pizzazz and Tangerine Tango inks. The greeting is stamped with Elegant Eggplant ink onto Whisper White Cardstock, cut out with a 1" circle punch and edged with Tangerine Tango ink before being adhered to the card front with a Stampin' Dimensional. The butterfly and flower introduce the Vellum element that Tanya included and I've embellished them with Metal Rimmed Pearls. The basic card is Elegant Eggplant and I added a very narrow edge of Lemon Lime Twist.